These days Neil Patrick Harris is known for being something of a song and dance man. After all, he followed up his run on How I Met Your Mother with a trip to Broadway and then tried his hand at an ill-fated variety show. 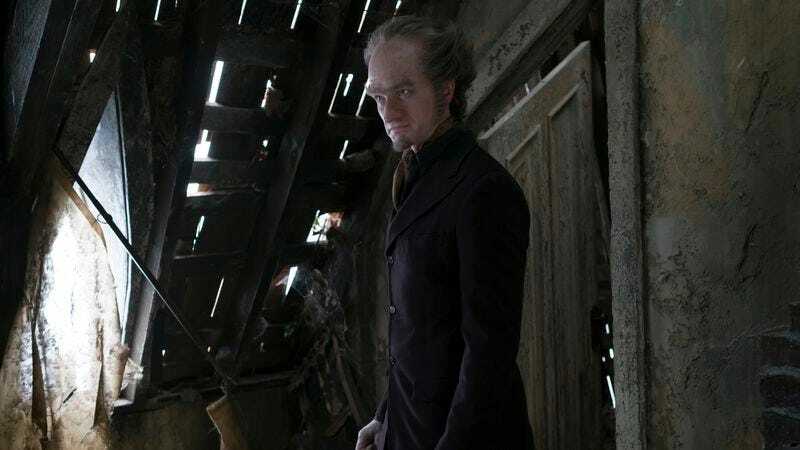 So what will his interpretation of Count Olaf, the Lemony Snicket villain in Netflix’s new take on A Series Of Unfortunate Events, bring? Song and dance, of course, but also a lot of playfulness and an impressively large prosthetic nose. The new incarnation of Lemony Snicket’s (the pen name for Daniel Handler) tale about the misfortunate about a trio of orphans is a corrective to the 2004 movie, which starred Jim Carrey in the role of Olaf. Handler didn’t get to see that project through to completion and neither did Barry Sonnenfeld, who returns, alongside Handler, as executive producer and director; both are now fully involved. A Series Of Unfortunate Events premieres early next year, on Friday, January 13. We got some (gory) details from Harris earlier this fall. The A.V. Club: How did you approach Olaf? Did you just draw from the text? Or did you take other inspirations to build your version of this character? Neil Patrick Harris: I mostly drew from the text. I wanted it to be as true to the material as possible given that Daniel Handler is actively involved in this iteration, and that Barry Sonnenfeld, who was involved in the movie, is now involved in it again. I was enamored with the fact that they were wanting this to be as true to the ideas of the story as possible. I didn’t really have any vested interest in doing the sort of NPH version of Olaf. Plus, I hadn’t really read the books before so it was all fresh and new to me. I wasn’t one that had read it and chewed on it and thought, “This is how I would do it if it were me.” I just thought, “What an interesting character.” He looked nothing like me, so then I was thinking in a Lon Chaney kind of way—how fun would it be to get lost physically in a character and be straight-up horrible, just awful without recourse, without self-reflection. So through that, I started thinking about Wile E. Coyote and about people who are just bad, delusional kind of people. NPH: Blindly thinking that he’s gonna finally do it this time and then he fails, and then he tries again and again and again and again. Because the darkness and the evilness that is in Olaf—I don’t want potential viewers to think that it’s horror-movie darkness. It’s delusional darkness, right? He thinks that when he leaves any building, there will be throngs of adoring fans wanting his autograph, and so he drinks boxed wine and has these henchmen around that don’t quite know what to say around him. He just sort of wanders in his own happy existence. And I think that’s where the comedy comes from. AVC: It must be fun to play this over-the-top actor part of him as well, yes? AVC: So you weren’t familiar with the books to start off with. Are your kids too young to get into them? NPH: They just turned 6. They just watched the first two episodes. We just had a cast and crew screening of it in Vancouver and they saw that. They thought it was fun—fun and silly and strange. I think the vocabulary of the books is a little advanced for them. I would say to wait a couple of years, but I think because I’ll be on the show, they’ll probably end up watching them all and then reading the books later. AVC: And you hadn’t been exploring them yourself? NPH: No, as I’ve read them now, and I’m on book 11, I have such an appreciation for Daniel’s ability to be dark, sardonic, overtly mean, and yet, have a real appreciation for vocabulary. It’s kind of a comedy runner, right? Of all those, “this word, which here means, and then what it means,” which usually is the actual definition with a sometimes stilted view. I think it teaches kids an appreciation of vocabulary and books and the written word. All of it, I think, is subtly—and not so subtly—encouraging kids to value books, to value words, to value sentences, to value the worth of words. I love that. AVC: You have Patrick Warburton playing Lemony Snicket. Does the show incorporate that wild, fun language into the series? NPH: A lot of language, yeah. Lemony is a real active participant in the show, so mid-scene, the camera will pan over or Lemony will walk into a scene and talk to the camera about what is going on. He breaks the fourth wall a fair amount. AVC: Is the series very faithful to the text? Does it diverge at all? NPH: Yeah. We are a pretty musical cast. K. Todd Freeman [who plays Mr. Poe] sings really well. He’s a big theater guy. Patrick sings as well. Not to put words into their mouths, but I think Daniel and Barry both recognize that you can diverge from the literary material in positive ways on TV because you can’t really write a song for a book, because you’re only reading the lyrics. So musically, they embellished a bit here and there to add a layer of sense of humor and weirdness. AVC: Are Daniel and Barry writing the music? NPH: Nick Urata, who is the musical supervisor on the project, wrote the songs. Daniel wrote the theme song. AVC: Oh, there’s a theme song. NPH: There’s a theme song. That I may sing. AVC: That you may sing? Has it not been decided yet, whether you’re going to sing it? NPH: Oh, I might not have sung it well. They could probably always get session people to do it. There’s some musical elements to it. AVC: In this first season, how far along do you get in the books? NPH: Each book is covered in two episodes. So, it’s essentially almost a feature film a book. It’s almost two hours per book. It’s kind of a great structure, because it gives you the whole first episode to start it, create the conflict, and then end it at a precipitous moment. Then the second episode will be from that point into resolution. And then we’ll hop into the next one. So we’ll do the first four books, through The Wide Window. AVC: What is the most disgusting part of your Olaf? NPH: Disgusting? Probably his teeth. His teeth and his confidence. AVC: There must have been a ton of makeup. AVC: Would they make the noses every day? NPH: Yeah, all the prosthetic pieces had to be made every day because then they are airbrushed and painted. I wanted it to not look like prosthetics. I wanted to still be able, even though this was all covered with prosthetics, to be able to wrinkle my brow and get that and not have it be this weird Klingon mask that was impenetrable. Because Olaf is a lot of expression. He’s very operatic, especially under Sonnenfeld’s thumb—extreme close-ups of raising an eyebrow and saying, “I’ll get those children if it’s the last thing I do.” He needed to be expressive. AVC: The Sonnenfeld look is so clear from what we’ve seen. What was it like working within that world? NPH: I couldn’t have asked for a better person to be a part of this, creatively. He’s so kind and so generous and so nice and still, to this day, has dedicated, I think seven days a week, I think 10 hours a day, if not more, on the show. Dealing with visual effects shots and music shots and ADR, and he’s so in it. And cares so much about it. And creatively, like you said, has proven himself artistically and visually so that when Barry’s on set and when it’s his episode to direct, everyone’s working harder. Everyone knows they’re safe in his twisted and demented hands. And so you can go full tilt, knowing that he’ll rein you in.